The Company Sources and maintains a roaster of efficient Masters and Crew. They are selected as per the Flag requirements and the Contractual Obligation with the Owner. - Compliance of Safe manning requirement of the Flag Administration. Sea4marine Shipping Management Pvt. Ltd.
An end to end Crewing Management Solution. Crew Search, Crew Planning, Engagements, Dis-Engagements, Appraisals form an integral part. Under this service crew is supplied as an integral part of a technical management contract or under a comprehensive crew management contract. In this case, Five Stars would be fully responsible for all matters concerned with the vessel crewing. Specifications Crew Information, Payroll, Reports, Integrated & automated Database, Query engine. The officers and crew occupying our vessels are the key to the upkeep of our huge investment floating out at sea. 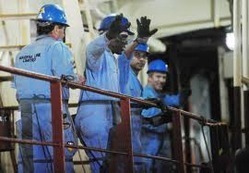 We understand the quality of human expertise is the most important factor in the management of a vessel.